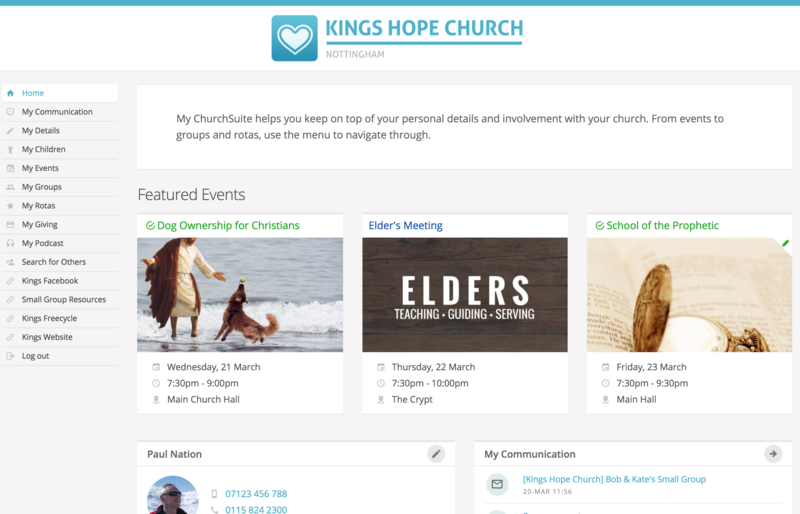 Access to My ChurchSuite is by an invitation proc initiated from your admin-facing ChurchSuite platform, so you can easily manage access to suit your church context. My ChurchSuite can also easily be styled for your own church, providing a familiar experience to your church members. And My ChurchSuite is accessible from any web browser, or using our free iOS or Android apps - app download links are embedded in the My ChurchSuite invitation email preset. In order for My ChurchSuite to work in other modules, it first needs to be activated in the Address Book module as this is the basic repository of contact data from which My ChurchSuite invitations are issued. You won't be able to send any invitations unless My ChurchSuite is activated for the Address Book. To activate My ChurchSuite, head into the Address Book module options - the cogwheels in the top right hand corner of the page. You'll need manage module or Administrator permissions to access this. The module options page has four tabs: Module, My ChurchSuite, Connect and Embed. Click on the My ChurchSuite tab and scroll down to the Settings section and make sure Enable My ChurchSuite access is ticked. My ChurchSuite is now enabled for your account; although none of your contacts will be able to access My ChurchSuite until they are first invited - see the related support article to do this. The remaining Settings relate to the Search for Others contact search functionality - see the related support article for guidance on configuring this option. Remember to save any changes made in the Address Book module settings before navigating away from the page. ...then locate the My ChurchSuite & Privacy section in the centre of the page. You can now set the My ChurchSuite settings as required for just this one contact. 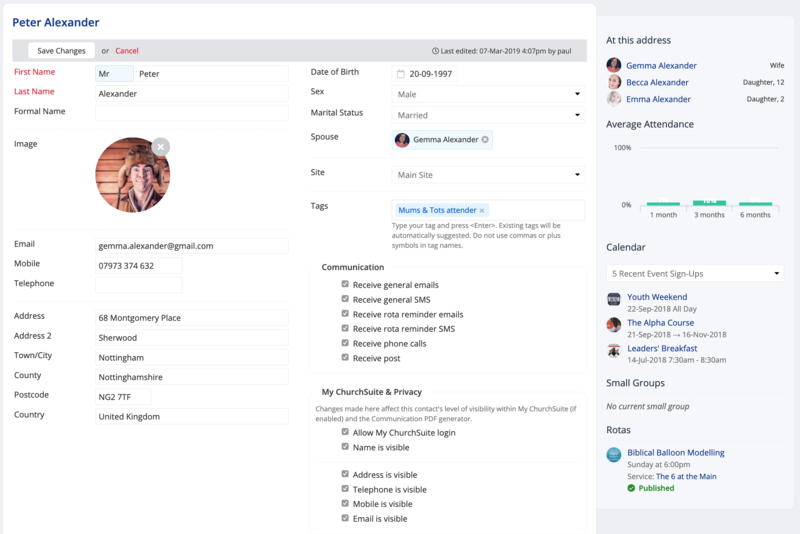 Save the contact's profile when you are finished. For each module that supports My ChurchSuite - Children, Calendar, Small Groups, Rotas and Giving - click into the module options (the cog wheels icon in the top right-hand corner of the module), and select the My ChurchSuite tab. To enable that module's My ChurchSuite functionality simply check the box that says Enable My ChurchSuite access - the example below is from the Children module. Remember to save your changes before navigating away from the page. Repeat this step for each module in turn. 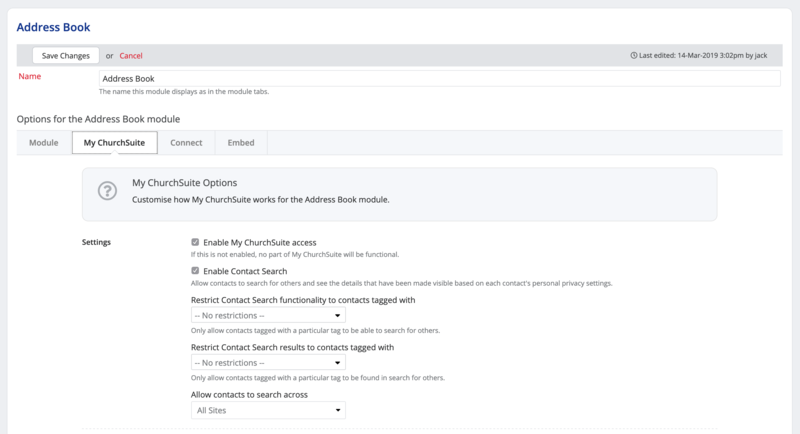 Note also that there are a number of other helpful My ChurchSuite settings on the My ChurchSuite Options tab for each module - further support articles are available covering these options.